The loud “bob-white” call of this small chicken-like bird can be heard for a quarter mile in open country. Northern Bobwhites are non-migratory, and are found in the eastern part of the United States from Nebraska to Massachusetts and southward to Florida and southern Mexico. This bird is a very popular game bird and a great deal of management attention has focused on understanding and reversing current rapid population declines. Description: The Northern Bobwhite is a round-bodied, ground-dwelling, brown bird. The male has a bold black-and-white face pattern, and the female is duller brown, with a buff face. Voice: The territorial cal is a clear 2-syllable ‘bob white,’ with the second note higher pitched and sharper. Similar Species: None, however various released quail-like birds may be occasionally encountered, all of which were released for hunting purposes. Habitat: Native grassland interspersed with thickets of shrubs, briars, and blackberry near deciduous or coniferous forest. Also found along farm field edges and in young pine lands. Diet: In winter, they eat mostly seeds, while in summer when raising young, they eat mostly insects. Nesting and reproduction: Pairs form by late April and males continue calling through July. Northern Bobwhites can raise multiple broods in a season, but this appears to be uncommon in Tennessee. Clutch Size: Usually 12 to16 eggs, but can range from 5 to 24 eggs. Incubation: Both sexes incubate the eggs for 23 to 24 days. Fledging: Within a day or two of hatching the young leave the nest. They are tended by both parents, but are able to feed themselves. Nest: The male and the female choose a nest site on the ground in dense brush, and both help build a shallow depression, lined with grass and leaves, with an arch built over the nest resulting in a well-hidden entrance. Status in Tennessee: The Northern Bobwhite is a permanent resident across Tennessee occurring in all but the highest elevations of East Tennessee. Their numbers continue to decline in the state. This decline is attributed to succession of young forests to mature stands, reforestation of farmlands, and modern agricultural practices. These practices include larger fields with fewer hedgerows, and the conversion of native pasture to exotic fescue, which yields little food and is unsuitable for nesting habitat. 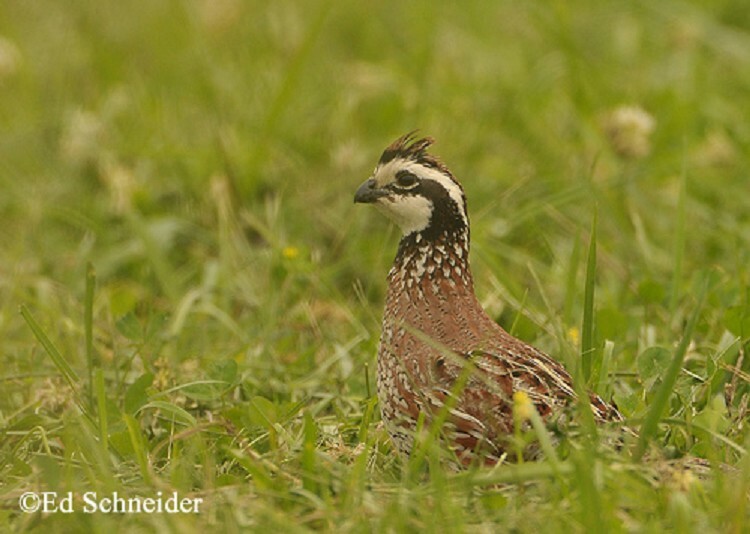 During the non-breeding season, Northern Bobwhites congregate in coveys of up to 20 birds. At night, members of the covey roost on the ground in a circle, tails inward with their heads pointing out. The majority of males heard singing are not mated!!! Best places to see in Tennessee: Northern Bobwhite breed in most counties in Tennessee. They are easiest to locate during the spring and early summer when males are most vocal. Some decent locations for finding the few remaining birds include Bridgestone-Firestone Centennial Wilderness and Bark Camp Barrens WMA. Brennan, L. A. 1999. 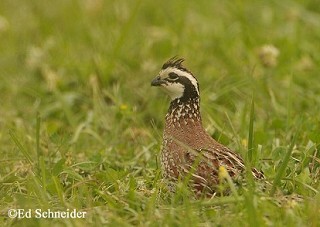 Northern Bobwhite (Colinus virginianus). The Birds of North America, No. 397 (A. Poole and F. Gill, eds.). The Birds of North America, Inc., Philadelphia, PA.